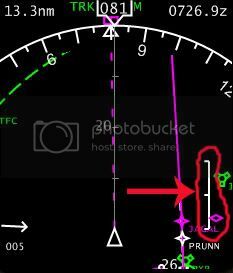 I don't know how many members here fly the Level-D, PMDG, Captain Sim, etc Boeing's but I decided to write this article to give everyone here a better idea on what instruments to monitor. This concept works on most payware Boeing's. Let's start near the TOD (Top Of Descent). If you pay a visit to the VNAV descent page on the FMC (page 3) after a VNAV descent is activated, you'll see a set of numbers/letters next to 4R LSK. The first set is FPA or Flight Path Angle. This is the current angle of descent. IE -3.6 = 3.6 degrees nose down. The second is V/B or Vertical Bearing. This is the required vertical bearing to reach the WPT/ALT restriction or the arrival airfield elevation. The 3rd is V/S or Vertical Speed. This is the required Vertical Speed to maintain the V/B. 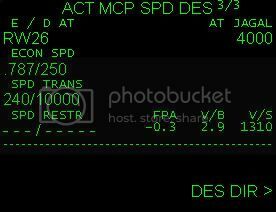 Also on the same page, on 1R LSK you'll see the name of a waypoint and a altitude below it. This is the current waypoint the V/B is calculated from. If you activate a VNAV descent before the TOD is reached, the AFDS/FMC commands a 1250FPM descent rate until the V/B is captured whilst still in VNAV. If you were to change to FLCH, "IDLE" is enunciated on the FMA then THR HLD and the AFDS adjust the pitch of the aircraft to maintain the MCP selected speed. 1st on the FMC progress page 2 take a look at 2R LSK at VTK (Vertical Track) Error. Vertical Track Error shows in feet the distance below or above the vertical track. It becomes active when a VNAV descent is activated. It's information is relayed on the EHSI (Electronic Horizontal Situation Indicator) or AKA ND (Navigational Display) with the Vertical Track Indicator. On the EHSI towards the bottom right, you'll notice something appears on the descent phase. This very handy feature is called the Vertical Track Indicator or VTI. The VTI shows deviations of the V/B +/- 400FT and works the same way as the Glideslope Deviation Scale does (the same as following a glideslope on a ILS). It's nothing more than a white solid vertical line with three smaller white horizontal lines (Top, Middle and Bottom) attached from the left side of the solid vertical line and a traveling magenta diamond. The middle horizontal line represents the aircraft's position and the traveling magenta diamond represents the V/B. When you are within 400FT of the V/B, the magenta diamond begins to move. When the magenta diamond reaches the middle white horizontal line, IDLE becomes the active thrust mode followed by THR HLD and the aircraft will begin to pitch down to maintain the V/B. Another very handy feature to use is the Altitude Range Arc (it looks like a green halo on the EHSI). The Altitude Range Arc represents the point at which the targeted MCP altitude will be reached. Once the aircraft is well established on the V/B, the altitude range arc should come to rest on the waypoint indicated in the VNAV descent page with the MCP altitude set correctly. 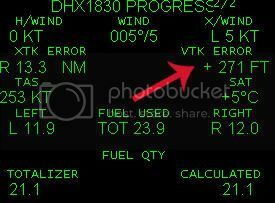 I also circled the VTI as it remains on the Navigational Display throughout the approach. The VTI is a very handy instrument to use on a Non Precision Approach (NPA) as the V/B on the final leg is calculated from the Final Approach Fix (FAF) to the runway threshold. Edited by Da Speznas, 15 June 2009 - 01:42 PM. Great tutorial! You have an impressive understanding of the FMC. Thanks! You're welcome and thanks for the comment. I'm considering writing some more tutorials for different phases of flight. Thank you, this was just for monitoring the VNAV Path during the decent phase, but soon I'll write some more about descent monitoring in general. Edited by Da Speznas, 16 June 2009 - 11:29 PM. Great tutorial Kevin.... keep me going! We need a sub-forum for Flight Training Tutorials! Edited by Bman., 17 June 2009 - 10:47 PM. I was curious about the logic of the magenta diamond. I have seen that sometime it is solid and sometimes hollow. Do you know the logic behind this? Doesn't seem to be consistent logic to me. Just to throw this into the mix........... Do you know where to find FMC instructions on Airbus A380???? I have hunted high and low and posted on forumn. no one seems to have any info.